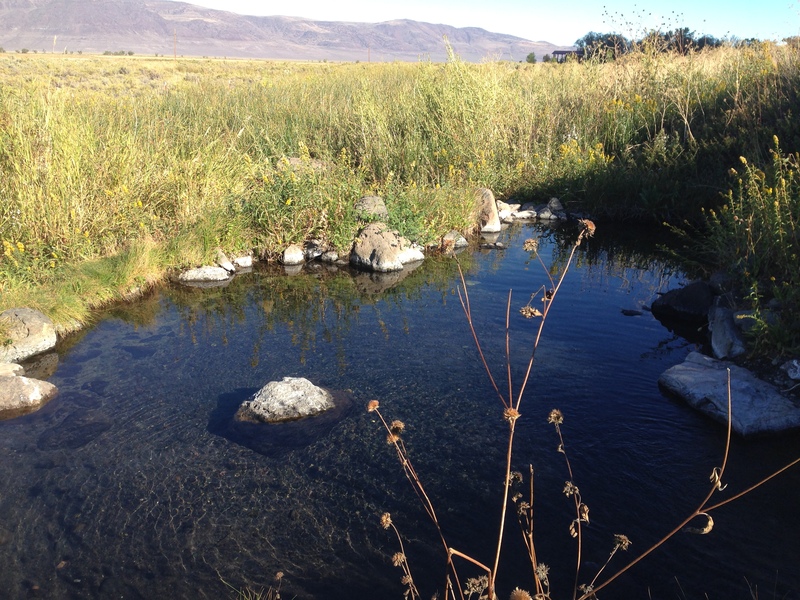 At the moment the Tassajara Fire ignited we were hundreds of miles away, relaxing in a hot spring at the eastern foot of the Warner Mountains. In front of us lay a small marsh, buzzing with dragonflies and birds. Beyond that, the vast deserts of the Great Basin. Behind us, the sun slowly sank beneath the rough spires of the Warner crest. Heading north we passed through Cedarville, declined the invitation of Woody’s Saloon to “Come in For a Stiff One,” and turned west over Cedar Pass. As we descended into the headwaters of the Pit River, we rounded a bend and were suddenly within range of the cell tower in the town of Alturas. Immediately, phones began beeping and chirping with the arrival of multiple messages. On my phone, it was friends and neighbors trying to find one another, worrying about each other’s animals and desperate for news about fire direction. There were multiple pictures of leaping flames in distressingly familiar locations. The messages for the Cal Fire Captain sitting next to me were more along the lines of “please come in, if you’re available, we’ve got an assignment for you.” We were both far too distant to be of any use. We decided to have that stiff one after all and stopped in at the Niles Hotel. What was obvious at a glance was that the Tassajara Fire had the potential to become a worst case scenario. A fire that ignites in a populated area at the bottom of steep terrain, in dry conditions, with high temperatures, low humidity, and erratic winds is a scary thing. Only stronger wind could have made it worse. Sometimes you wake up at night and find the sky glowing red. Sometimes you smell smoke and simply turn around. Sometimes you’re working inside and get alerted by a call from a neighbor. But however it happens, that moment you first see the boiling black smoke and realize a large fire is bearing down on you and your home is a moment you’ll never forget. A rapidly moving fire is an inherently chaotic situation. If you are truly in immediate danger you will likely be completely on your own. No deputies or firefighters will arrive in time to assist you. Your life and the life of your loved ones and animals may well depend on the decisions you make in the next few minutes. Should you run, and risk being caught by the fire on the road? Should you stay and hope your fire clearance is enough to make sheltering in place viable? Do you have time to gather photos, important papers, and pets? Should you try to load your livestock? Should you turn them loose? Do you have neighbors that might need help to escape? In the heat of the moment, platitudes about everything but life being replaceable and avoiding risks are useless. The roaring and crashing of approaching flames has a way of bringing reality, in all its irreducible complexity, into sharp focus. It’s not a pleasant thing to go through, and realizing that others, including friends, are going through it even as you sit sipping a cold drink in the calm of a distant barroom is also unpleasant. 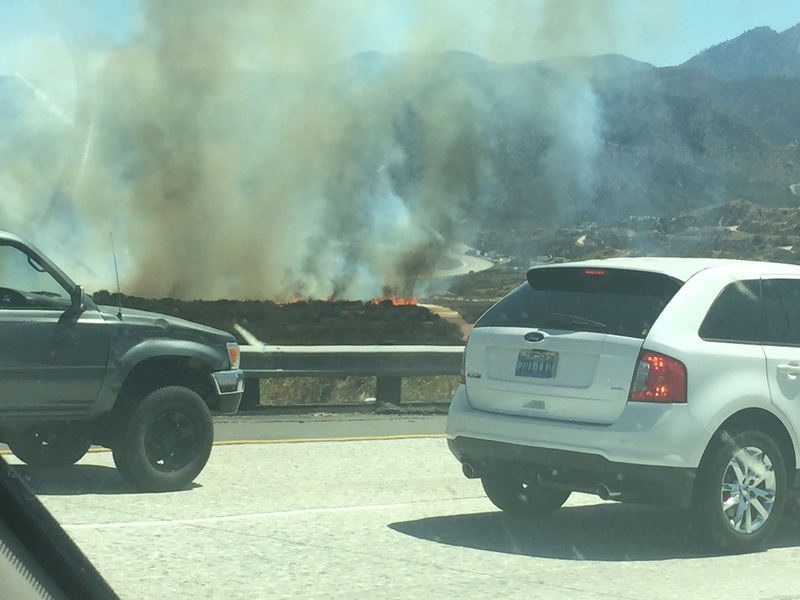 Photo my daughter took of the North Fire burning toward I-15 in the Cajon Pass while she and her family were stuck in stop and go traffic on July 17, this year. They made it through before the fire reached the road, but only a little behind them people were not so lucky. Travelers had to abandon their cars and run for their lives. 20 vehicles were destroyed and many others damaged. Getting stuck in traffic while trying to flee a fire can be more dangerous than sheltering in place at home. When a fire breaks out, everyone wants to know exactly where it’s burning and where it’s going next, yet in those first critical hours, not even incident command has complete or reliable information. In the absence of solid facts, rumors, some true, most not, proliferate and spread faster than the fire itself. On social media, hundreds of useless posts must be sifted to find one with information of any value. Most media outlets, either because they’re desperate enough for page views to print anything sensational without regard to credibility or because their reporters are so unfamiliar with the area that they get confused and substitute the name of one canyon, ridge or road for another, are equally unreliable. During the Basin Complex Fire a reporter went to Bottcher’s Gap, at the end of the Palo Colorado Rd. and from that vantage point took a picture of fire burning on Launtz Ridge, deep in the Ventana Wilderness and far from populated areas like Palo Colorado Canyon. Not knowing, apparently, the name of any landmarks other than the road, the photographer set off a minor panic by publishing the picture with a caption indicating it was of fire in Palo Colorado. More recently, on the first day of the still ongoing Valley Fire, a false rumor began circulating that the High School in Middletown had been destroyed. Probably desperate to be the first to confirm the story, a Bay Area reporter tweeted a photo she claimed was of the High School on fire. Even though Middletown residents quickly responded to point out that the photo was actually of an apartment complex, the reporter and her station did not correct the error, and the photo continued to be circulated and retweeted as evidence that the High School had burned. In the end, about the only fire information you can semi-trust is what comes directly from eye witnesses who genuinely know the area and understand what they’re seeing and what comes, often long after the fact, from fire agency Public Information Officers. Even in the age of social media, there is just no way to know exactly what’s happening as it happens. As it turned out, much was lost, but even more was saved. Without fast and effective action from firefighters the fire would certainly have run over the top of Chew’s Ridge, and on up Finch Creek toward Cahoon and Arroyo Seco; with many additional homes destroyed. The quick halt of the fire’s forward progress also greatly limited the amount of the Finch and Cachagua Creek watersheds burned, which may well prove important if heavy rains arrive this winter, as predicted. Here’s to gentle, but soaking, October rains and an early end to fire season. This entry was posted on Thursday, September 24th, 2015 at 12:32 pm and is filed under Fire, Santa Lucias. You can follow any responses to this entry through the RSS 2.0 feed. You can leave a response, or trackback from your own site. Thank you, very beautifully said, and very moving. Even in town, it was difficult to follow the fire precisely, and I paid close attention. Enough for me to know it was very serious and thankfully put out before it spread and destroyed more homes. Great job firemen, our heroes.